In a world that is warming at unprecedented rates, aquatic ecosystems are affected down to their very foundations, where microscopically small phytoplankton fuel food webs and are major contributors to biogeochemical cycles. 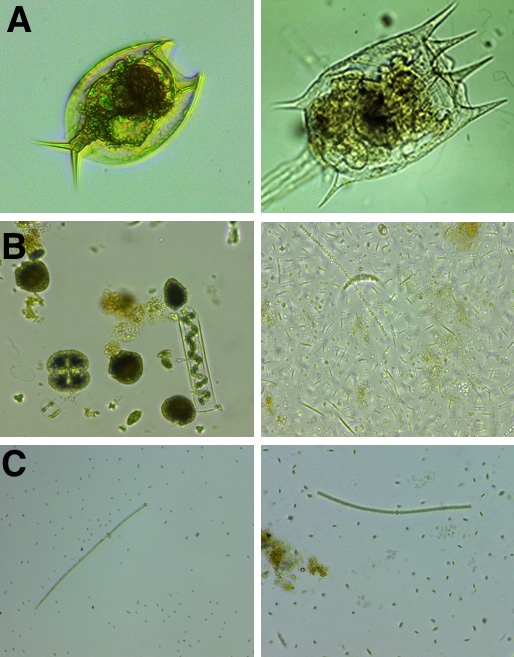 We isolated green algae from a mixed, semi-natural mesocosm community after a decade of experimental warming, and find them strikingly different from their ambient-evolved counterparts. In this "behind the papers" entry, we shed light on how the samples were taken, and on what is special about the heated mesocosms. Without fail, when my less biologically inclined friends find out that I am working in a lab that looks into how the metabolism of organisms changes throughout evolution to aspects of climate change, I am met with fairly thinly veiled disappointment over how we are not working on kangaroos, basking sharks, or the gob-faced squid. While all of the above are charismatic and have important roles to play in their respective ecosystems, our model organisms are phytoplankton, the microscopically small, yet food-web fuelling basis of most aquatic ecosystems, that produce the oxygen in every second breath we take, and are responsible for the oceans’ capacity as a sink for carbon dioxide. With the world warming, predictions on how these organisms are going to change and respond are dire: our aquatic food-webs hinge on net primary production, but global models predict that within the next few decades, net primary production might decrease, as a result of phytoplankton increasing their respiration rates more than their photosynthesis rates when faced with acutely elevated temperature. This, however, does not take into account that phytoplankton are going to experience climate change as a gradual process rather than an acute change. Experiments focusing on acute responses give us a good understanding of the tolerance that phytoplankton of today would show were they to be dropped into the ocean of tomorrow, but will likely not be able to tell us whether or not the phytoplankton of tomorrow would maintain the same responses on evolutionary time scales. Phytoplankton divide rapidly, i.e. about once per day (compare: basking sharks reach maturity at thirteen years of age and live well into their fifties. One can and should not attempt to fit them into a petri dish, either), and live in large populations of thousands of cells per mililitre of water. This means that they are able to utilise or generate large standing genetic variation that selection can then act on throughout a few hundred of generations – within a couple of years. To gain a better understanding of questions that go beyond figuring out how evolution acts to shape the phytoplankton populations of tomorrow, we can dream up ever more complex laboratory based experiments and slowly go ever more insane. Alternatively, we can also take the lab into a more complex environment, which is exactly what mesocosms do. 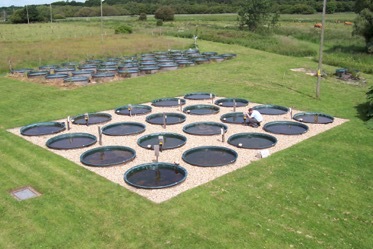 The freshwater mesocosms in question here are located at the Freshwater Biological Association Laboratories in Dorset, UK (Fig. 1). Eleven years ago, all twenty mesocosms received the same mixed inoculum of various freshwater phytoplankton, zooplankton, invertebrates, and plants to create a semi-natural starter population. Since then, half of the mesocosms have been kept heated to 4ºC above the ambient temperature. This gives us a unique opportunity to study the mechanisms of thermal adaptation in a complex setting, but without the confounding factors that often arise in space-for-time substitution studies across broad-scale thermal gradients over latitude or altitude. Fig. 1: The mesocosm set-up at the Freshwater Biological Association. Of 20 mesocosms, half are kept warmed to 4ºC above ambient. All mesocosms were inoculated with the same mixture of phytoplankton and zooplankton eleven years ago. They are open to air-borne colonisers and between-pond dispersal. In this experiment, we set out to investigate the mechanisms of thermal adaptation in an alga from a natural community. 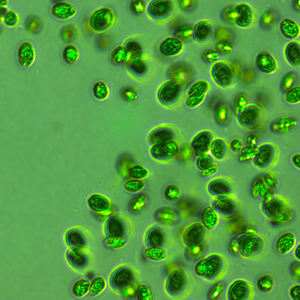 The first step entailed isolating Chlamydomonas from its other algal friends. To do so, we passed our samples through a 20µm filter to eliminate larger phytoplankton and grazers. 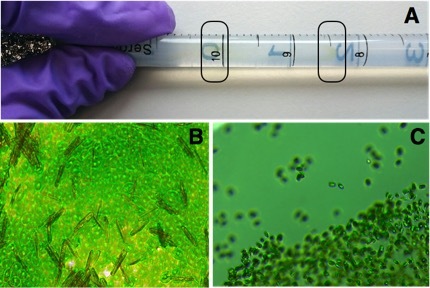 The second step involved a series of ‘pipette races’ (see Fig 2 A), where agar is poured into a pipette and topped up with a few droplets of algal culture. The pipettes were then wrapped in tinfoil apart from the top, and placed upwards facing a light source. Motile autotrophs race through the agar towards the light source, leaving behind fungal contaminants and other non-phototrophic and/or non-motile co-inhabitants. Paula Lopez-Cuellar, the MSc student behind this paper, then worked her green-fingered magic and plated the samples onto agar plates, which we can use to pick a single colony of the same species. In cases where samples had not been completely separated (Fig. 2B), the plating step was repeated until all cultures were the same species (Fig. 2C). Fig. 2: Steps of isolating Chlamydomonas from a mixed phytoplankton community. A: The end of a pipette race. Fast swimmers (dark circle near ‘8’ mark) have formed a band further away from the dark end (gloves), slow swimmers (dark circle near ‘10’ mark) have formed streaks closer to the dark end. B: Mixed community on agar plate (diatoms and green algae). C: “Clean” culture of Chlamydomonas after plating on agar. Throughout the experiment, it transpired almost immediately that the warming had created a monster: in contrast to predictions of decreased net photosynthesis with warming, our warm-adapted Chlamydomonas from the heated mesocosms not only have overall higher net photosynthesis rates at all temperatures tested in this experiment, they also outcompete their respective isolates from the ambient mesocosms in almost all circumstances – possibly because their higher photosynthesis rates allow for a greater allocation of energy into competition. We now have reason to wonder about why those warmed isolates have not taken over the other ponds or indeed all the neighbouring brooks and lakes. Dispersal between ponds is difficult to quantify, but is assumed to occur easily given their close proximity. So, if the algae do better both physiologically and in terms of competition, and temperature is the distinguishing abiotic factor between the ponds, how come we don’t find them everywhere? We discuss, in our paper, how this could be driven by the ambient ponds’ experiencing near-freezing winter temperatures below the temperatures used in our experiment, and that one level up the food-chain, composition of microscopic grazers (see Fig. 3A) may also vary between treatments, and that could in turn drive in-situ trade-offs outwith the scope of what we were able to measure in the laboratory. The question further remained, what was it that made the algae more competitive in the first place? Fig. 3: Mixed communities from the Dorset ponds. A: Two different species of heterotrophs found at greater prevalence in the heated habitat at the time of sampling (spring). B: Communities in the warmed pond (here, photographs randomly selected for pond 9 and pond 14, respectively) are more diverse and have larger biomass than communities from the ambient pond, as seen in panel C, where communities are dominated by few species. In our paper, we were not able to give more thought to this, as much as we might have liked, as scientific writing does not usually allow for tangents, and is in its straight-forwardness in fact more reminiscent of very old story-telling (this is an observation, not a criticism), where the forest is deep, the water dark, and the queen murderous, and no side-tracking or adverbs are allowed ever, only that here, the forest is a microscopic aquatic one, the water not so dark, and we generally try to avoid fatalities. While we do not know exactly which dynamics in the microscopic forrest give rise to higher competitiveness of our green critters, what we know is that the heated ponds are also home to greater biodiversity (see Fig. 3 B and 3C) and more algal biomass, while the nutrient standing stocks are about equal between the heated and the ambient cosms. This means that the environment in the heated ponds is likely a more competitive one to begin with, so competitiveness could be under selection directly here as well. That, however, remains to be found out in another study.